Samson's SXD5000 Power Amplifier combines impressive power with advanced DSP technology, pushing the boundaries of value, performance and reliability. Effect Your Power. 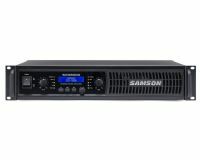 Samson's SXD7000 Power Amplifier combines impressive power with advanced DSP technology, pushing the boundaries of value, performance and reliability. Ideal for powering near field monitors or installation sound, the new Servo 120a provides you with "reference-class" audio performance and reliability in a compact package. The Servo 600 is ideal for larger applications where added power is needed to drive multiple speaker chains, or larger format speakers. The Servo 300 is a great choice for powering a small to medium sized PA, or an intergrated conference room audio system. 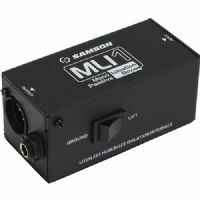 The Samson MLI1 is a mono passive isolation box designed to remove hum and buzz caused by ground loops, as well as convert unbalanced signals to balanced signals for long cable runs. Channel Your Sound. You've positioned your microphones, set your levels and everyone's ready to record. Now, you need a way for each performer to hear themselves. 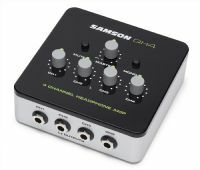 That's where the Samson QH4 comes in. 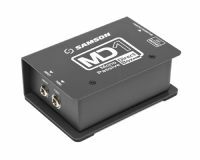 The MD1 Mono Passive Direct Box combines premium sound circuitry with durable, roadworthy construction, providing high-quality signal connection solutions for a variety of live sound and recording applications. 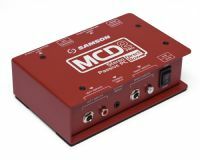 The MCD2 Pro Stereo Passive PC Direct Box is the ideal solution for connecting unbalanced line level signals from laptops, CD/MP3 players, and DJ mixers to professional, balanced equipment.